Google wants to ‘hitch its wagon to a star’ to beam internet access to the farthest corners of the world. So the tech giant, along with Fidelity, has invested $1 billion in the private exploration company, SpaceX. Google and Fidelity will collectively own just under 10 percent of Space Exploration Technologies (SpaceX), founded by Elon Musk. The company said in a statement that this funding would be used to "support continued innovation in the areas of space transport, reusability, and satellite manufacturing." The latest investment values SpaceX, which designs, manufactures and launches the world's most advanced rockets and spacecraft, at over $10 billion. 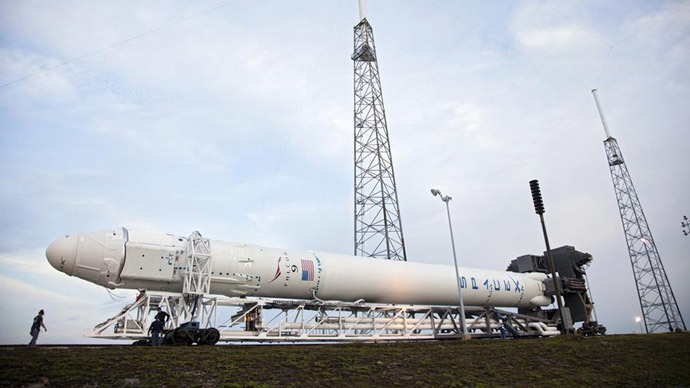 SpaceX have been used to deliver goods to the International Space Station. On Monday, SpaceX founder unveiled plans to use hundreds of satellites placed 750 miles above the Earth, far lower than existing communications satellites for an ambitious space internet project that would provide faster and cheaper access worldwide. "The speed of light is 40 percent faster in the vacuum of space than it is for fiber. The long-term potential is to be the primary means of long-distance internet traffic and to serve people in sparsely populated areas,” Musk, who is also the chief executive of US electric carmaker Telsa Motors, told Bloomberg Businessweek. "Our focus is on creating a global communications system that would be larger than anything that has been talked about to date," he added. Meanwhile, Google founders, Larry Page and Sergey Brin, are well-known aviation and space aficionados. In November, Google took over an historic Navy airbase, NASA's Moffett Field Naval Air Station on the San Francisco Peninsula. The former US Navy airbase is currently home to NASA's Ames Research Center, within walking distance of Google's main campus in Mountain View. The owner of the largest internet search engine and digital ad network, Google boasts a strong presence in the aerospace sector following several acquisitions last year, including a company that captures high-resolution imagery with satellites, Skybox Imaging, purchased for $500 million in June. In April, Google acquired New Mexico-based Titan Aerospace, the drone startup that makes jet-sized solar-powered drones, which Facebook had also reportedly wanted to purchase. Google said the challenge was to collect images and offer online access to remote areas.